Band Camp Begins Next Week! Dress: Camp Uniform (Players: Dark Shorts, White T-Shirt, Tennis Shoes, Socks) No sandals or flip flops! Do not bring or consume soft drinks or energy drinks of any kind—water only! Fees: The final band fee payment per student was due on 7/25/13. Failure to pay band fees or to secure arrangements with Dr. Sargent may result in our program not surviving the season with enough resources. Wednesday, 7/31/13: Band Shoe Fitting at band room, 3:00-3:30 pm. (Those needing shoes will need to stay just a few minutes after dismissal that day). Bring a check for $31.00 made payable to Gadsden Music Co. Anyone missing this fitting will need to go to Gadsden Music or Rose Shoes on Old Springville Road (Next to Publix) to purchase shoes. All students must have band shoes by August 7th for the band photo. Tues/Wed, 8/6-8/7: MHS registration. Neither band nor auxiliary students are needed at registration. Parents or guardians should plan to register their students. If this is not possible, first contact Dr. Sargent. Students needing to register themselves will need to do so during afternoon sectional time, NOT during morning band field time. Immediately upon registering, students are to return to band camp. Registration is not an excuse to go home early for the day! Thursday, 8/8/13: Band Photo Session, 6:00-8:00 pm. Band room will open at 6:00 call time for uniform retrieval and truck loading for instrument transport to stadium. Uniforms must be returned to band room for drying after photo shoot. Individual photo order envelopes will be available for those wishing to purchase personal copies. Attendance is expected of all students. Missing photo session = no appearance in program or yearbook photos. Saturday, 8/17: Concession Workday, 9 am. Pressure Washers Needed!
. . . and others items TBA. Please come support your Moody Blue Devils Band! Summer Band meets this Thursday, July 11, 6-8 pm. $100 band fee installments due. Extra T-shirt orders due. Leadership workshop reservations due-- please add your desired t-shirt size to the reservation form. Band Field workday this Saturday, July 13, 8-10 am. Measuring and lining band field-- 4-5 volunteers needed to help Dr. Sargent. Student leaders welcomed and encouraged to attend. For those willing to serve in or lead a field maintenance team for the season, this also serves as a training session on field layout. Field mowing is also a possibility for adults with mowers-- weather permitting. Also, band truck cleanup (bring supplies and a long garden hose) for parent chaperones and a few students. Concession workday to be scheduled at a later date. E-mail Dr. Sargent with questions at brad.sargent@sccboe.org. Band Booster Meeting, Tuesday, July 16, 6:30-7:30 pm, band room. This was not on the schedule previously, so please add to your schedule if you're able. The agenda includes preparations for band camp. Vivace Student Leadership Workshop, Saturday, July 20, all day. Registration due on July 11 at summer band for students wishing to attend. Auxiliary/ Percussion camp begins, Wednesday, July 24, 8-12 noon. Refer to previously distributed schedule for details. This year's contests: October 5 and October 12. Please remove September 28 from the earlier schedule (That's homecoming weekend). Are you serving or have aspirations of serving as a student leader in the MHS band or auxiliary? Do you want to make the MHS band the best it can be, regardless of your position in the band? Consider attending the 2013 student leadership workshop at Homewood High School on Saturday, July 20th. 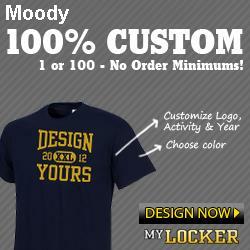 Registration forms and more info available on the Moody Blue Devils Yahoo Group files section. Reminder: An official band t-shirt is included with each paid band fee. For those wishing to order extra t-shirts in addition to the one issued, please use the form that was distributed with this year's band packet (or look for the form in the Yahoo Group files. Orders are due at the next summer band rehearsal, July 11th. See you then!